Sarbat Da Bhala Charitable Trust (Regd.) Managing Trustee, Sh. S. P. Singh Oberoi handed over a cheque of Rs. 3,37,425/- to the needy and the meritorious students of M M Modi College here as their annual scholarships for the current year. Addressing the college students, on behalf of the trust, Mr. M. L. Hasija, Director (Education) of the trust informed about the activities of the trust in the field of education and social welfare. He said that the trust is helping the needy and meritorious students. He further said that no student should be deprived of the opportunity to be educated. He also expressed that the evils of poverty, superstitions and drug addiction can be eradicated by spreading quality education. Women empowerment can also be achieved through education. Dr. S. P. Singh Oberoi promised to get the seminar hall of the college air-conditioned. College Principal, Dr. Khushvinder Kumar, welcomed the Chief Guest Dr. S. P. Singh Oberoi and other dignitaries. He lauded the great monetary contribution of the trust and expressed that their donations for a noble cause will certainly transform the lives of many young boys and girls who other wise could not have continued their education. Prof. Balvir Singh expressed his views on the challenges to higher education especially the funding of higher education. He appreciated the contribution of Sarbat Da Bhala Trust in helping the poor students and other sections of the society. Mr. Ishnoor Ghuman, Ms. Deep Priya and Ms. Garima were felicitated by the trust as they presented papers on higher education and the role of philanthropist organizations. Mr. Gagandeep Singh Ahuja, Secretary, Dr. Gurpartap Singh, Vice President, Sh. Harvinder Singh Kuku, Media Incharge of the Turst and Sh. Prabhleen Singh were present on the occasion. 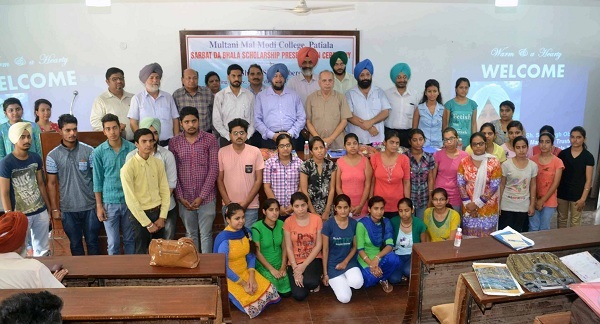 Prof. Poonam Malhotra, Dr. Harcharan Singh, Prof. V. P. Sharma, Prof. Harmohan Sharma, Prof. Gurpreet Singh and Prof. Harmohan Sharma were also present during the function. Prof. Balvir Singh conducted the stage. Dr. Vinay K. Jain presented the vote of thanks. Sh. 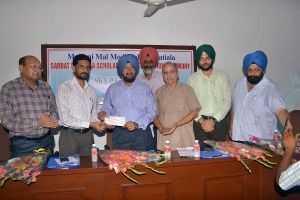 S. P. Singh Oberoi and administrative officers of Sarbat Da Bhala Trust along with college staff and students who got scholarships.